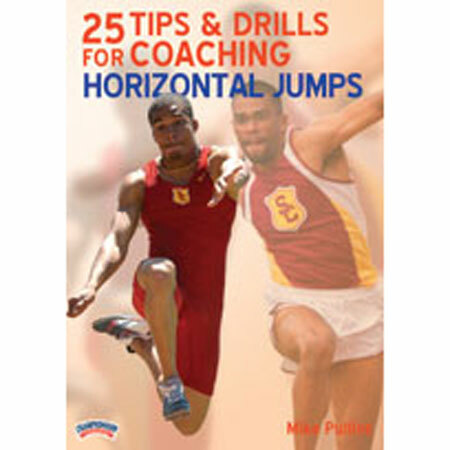 Mike Pullins shares his successful teaching tactics and tips in this DVD on coaching the horizontal jumps. Approach runs are a must for all jumpers and will allow the athlete to have jumping success. Coach Pullins believes 16 to 20 steps is the aim early in the season for approach runs. He teaches to drive out on the first four steps to build speed on the approach. To develop a good approach, Pullins demonstrates a "push, pull, plant" technique that incorporates hurdles on the jump runway. First and second phase run off, standing landing drill, box step, small hop & big step, standing 4-step and the first & second phase long jump are all good drills for pre-season workouts. Each drill is slightly different and has a special skill focus. 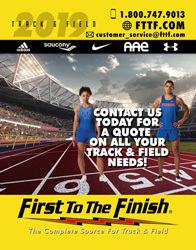 Advanced drills for experienced jumpers include single leg projection hops, step drill, straight line paw repeat, paw read push drill, alternating step, single leg hop and the strong/weak drills. Rhythm is crucial to the jump events and improvement comes from the rhythm run off drill. The walking extension drill uses hurdles and enhances flexibility, posture and a straight line push. As a bonus, Pullins demonstrates 22 additional drills using med balls, resistance bands, jump pads, boxes and hurdles to create the desired effect. The emphasis is on addressing conditioning, flexibility and proper posturing.